Why are you doing the action on April 5? We’re doing it because in our City homeless people living under the Gardiner with no heat are evicted. 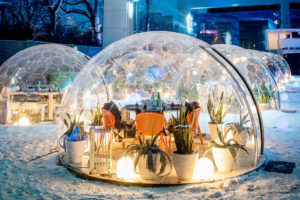 Meanwhile pop-up restaurants serving ritzy dinners in heated domes under that same highway are granted permits. Such brazenness begs a challenge and we’re happy to oblige. Why take issue if the homeless camp wasn’t located at the Bentway? There were multiple homeless camps under the Gardiner this past winter – from Jarvis in the east-end to Spadina in the west-end – and the City evicted them. For years, homeless people and advocates have also been calling for the City to open up the armouries as temporary shelter. The pop-up restaurant sits at the doorstep of the Fort York armoury. Is the action unfair to the people who paid for a novel dining experience? On the one hand you have homeless people whose tents were demolished and who were evicted with nowhere else to go. On the other hand you have people with sufficient disposable income to splurge over $550 on a single meal and who’re facing the possibility of their luxurious dining spectacle being tainted. The answer to who the situation is unfair to is clear. Put another way, did the restaurant patrons personally evict the homeless from the under the Gardiner? No. Is their chichi dining experience close to where people people were often hungry and cold, crass? Yes. Do they deserve to be mocked for their obliviousness to the suffering around them? Absolutely. But isn’t your beef with the City? 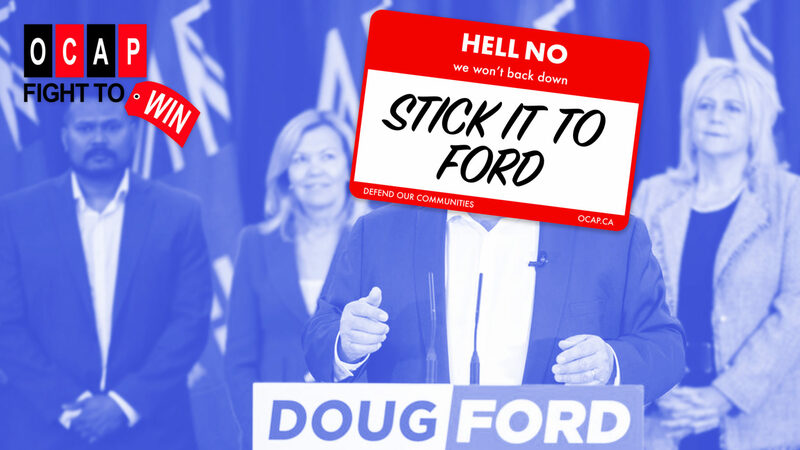 Yes, particularly with Mayor John Tory and his backers on Council who’ve allowed Toronto’s housing crisis to turn deadly. 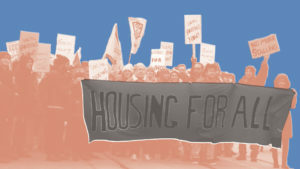 They deserve our wrath and we must demand that they build adequate emergency shelters and rent-geared-to-income housing. Why not go to City Hall? We have enough trespass tickets from City Hall to prove we go there often and have also slept-out outside one of Mayor Tory’s multi-million dollar homes. 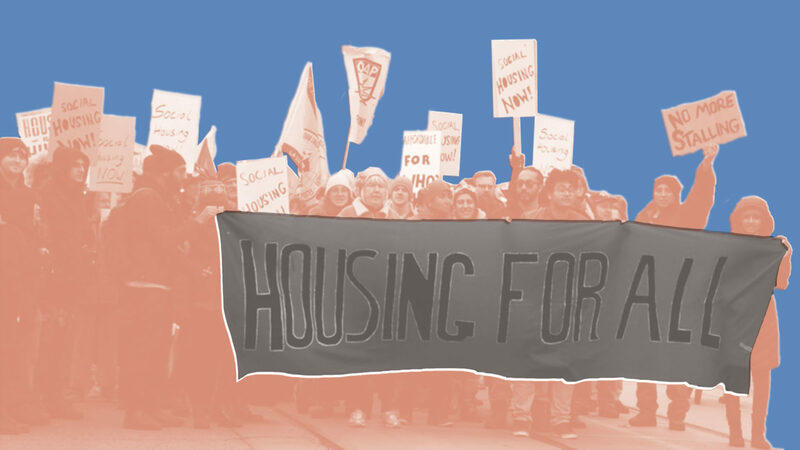 On Friday, April 12 at 1pm we’re going to Metro Hall to demand the City keep homeless respite sites open, expropriate a vacant property, and build rent-geared-to-income housing. We invite everyone to join us there too. There are many fancy restaurants in Toronto, why single this one out? You got us. Boorishness by the wealthy shouldn’t be tolerated anywhere. Our society desensitizes us to poverty and we accept outlandish things as normal. Luxury dining domes under the Gardiner would be a new frontier in this desensitization, and we intend to not cross it. 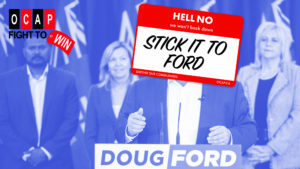 The social assistance reforms that the Ford Government announced today can well be described as the new Doug Ford Poor Laws. As expected, they’re making Ontario Works (OW) and the Ontario Disability Support Program (ODSP) significantly more restrictive and precarious. The basic intention is to refine the system as a tool to push people into the lowest paying and most exploitative jobs on offer. It is entirely in line with the attack they have already carried on the minimum wage, workers’ rights, and job protections. 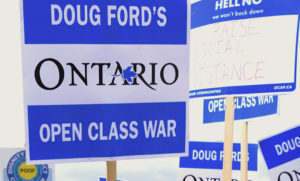 Forcing people off social assistance while depressing working conditions in the midst of a housing crisis won’t move people out of poverty but will make the Progressive Conservative’s bankrolling base of business executives and owners even richer. 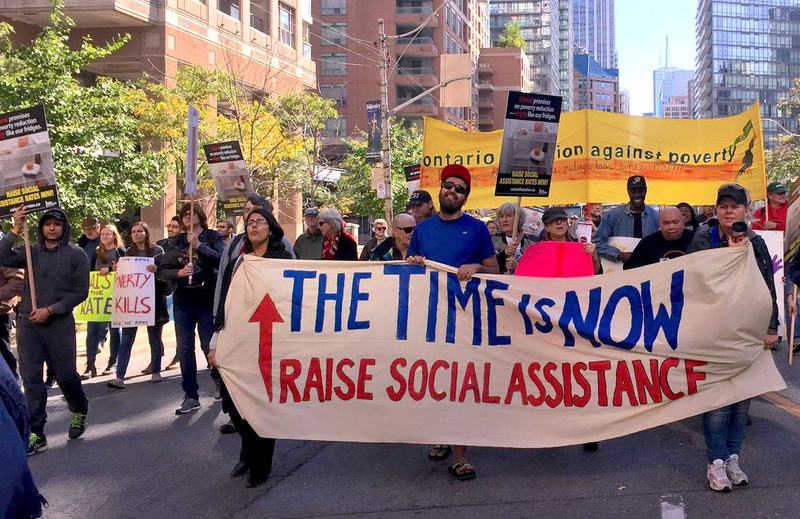 The reforms will divide people on social assistance into those deemed the most severely disabled and those who must join the scramble for jobs. The kind of “compassion” that severely disabled can expect from this Government is made clear from the fact that the social services Minister, Lisa McLeod, would offer no comment on whether any increases in social assistance rates can be expected over the next three years. Those presently on ODSP will be grand-parented into the new system but new eligibility rules will use the more narrow federal definition of disability. 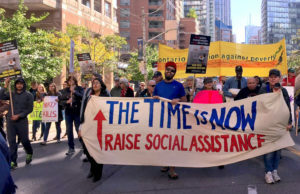 Many who could get onto ODSP under the existing rules will be forced to try to live on OW, including having to look for work even when they are too unwell to do so. All those who are deemed capable of working will be expected to comply with “individual action plans” and the Government’s “Open for Business” website will draw the most unscrupulous employers directly into the process. Local municipalities will be encouraged to compete with each other in the development of punitive and intrusive practices designed to hound people into scrambling for the worst jobs. The door is certainly open to the privatization of delivery and services. The government also signalled that supplementary benefits accessed by people on social assistance will be moved from being mandatory to discretionary. These benefits will likely differ from municipality to municipality. So we’ll be left with a patchwork of benefits with no access to the Social Benefits Tribunal to appeal denials. Outright elimination of particular existing benefits remains a possibility. People on OW will only be able to earn $300 monthly without claw backs, up from the current $200, but less than the $400 it was supposed to go up to this December. Earnings above $300 will be subject to a 75% claw back, which is worse than the current 50%. The earning exemption for ODSP changes to $6000 annually, but is again subject to the increased 75% claw back beyond that limit. 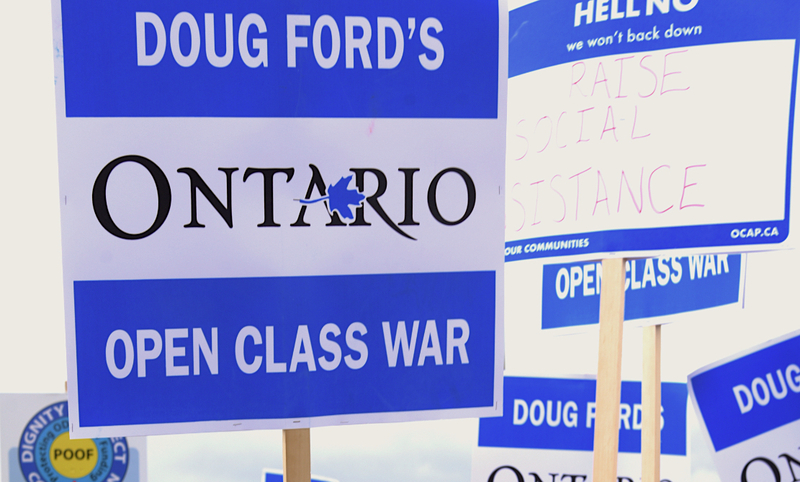 Over the next eighteen months the full viciousness of the Doug Ford Poor Laws will emerge but it is already clear that, for the Tories, social assistance is a weapon in their war on the poor.